“Cohousing is a form of collaborative housing that offers residents an old-fashioned sense of neighborhood. In cohousing, residents know their neighbors well and there is a strong sense of community that is absent in contemporary cities and suburbs. Want to learn more about cohousing? 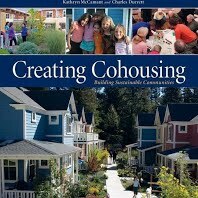 Creating Cohousing by Kathryn McCamant & Charles Durrett is an introductory guide to the concept of cohousing. Copies are available for purchase at our regular meetings.